The original Kiwi was made on a 3D printer, out of acrylic, and hundreds of iterations have led to the one you see here. Today the Plastic Kiwi is made from injected molded Polycarbonate, making it virtually invincible. Any areas vulnerable to abrasion have been reinforced with metal parts to ensure longevity. A magnet was designed to hold together all of the necessary mechanics and even lets you store your Kiwi in unconventional places. We have scrutinized the manufacturing process to make ensure a reliable tool that will never fail. Made from injection molded polycarbonate and hand-sanded for a satin finish. We’ve taken our beloved Paperstone and upped the hue! Meet Azure Paperstone, A truly beautiful material that has left a fine blue dust across our entire studio! All Test Kitchen releases comes in a our Kiwi Carrier, carved from Maple here in our studio, that includes the same batch number as your Kiwi! For those of you that are new, Paperstone is a sustainable alternative to concrete and traditionally used for counter tops. It has the genuine hand-feel of stone, yet Paperstone is made from compressed, recycled paper and a non-petroleum resin. It’s exceptional durability and unique finish is the reason why we are so excited about it! This is the first release from the ErgoKiwi Test Kitchen. Each release, we’ll be exploring new and unique materials and design concepts as we continue to hone our craft. These releases are small-batch and each Kiwi is uniquely numbered. Any accompanying Kiwi Carrier will be numbered to match your Kiwi as well. Padauk is a hardwood from Central Africa best identified by its rich red tone. While strong, Padauk is less dense than other hardwoods, creating a handle with a more agile, lighter feel. Each Kiwi has been handcrafted in our studio in Dorchester, MA. 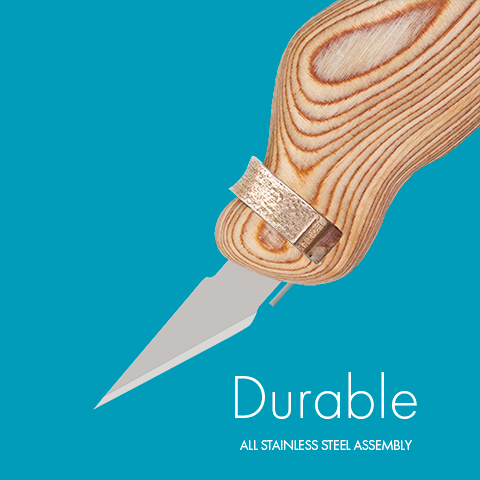 All other components are made of stainless steel latch to ensure a long, durable future. Laser-etch your Kiwi with custom text or Logo. Both of us have etched our Kiwis at some point in time, then one day we realized that everyone else might like the idea as well. We will work directly with you to figure out your ideal composition; we’re very good at making things so give us a challenge! Sign up to hear about all the new things we’re working on! We’re not here to fill your inbox with promotions, we just want to let you know when we’ve got new things in store! Thank you! When we’ve got something good we’ll let you know!